I have purchased two orders from Cable Chick and I have nothing but praise for your organisation. The goods arrived in perfect condition, were exactly to my specification and were accompanied by a couple of Minties. When you are spending money on electronic gadgetry, it is always good PR to have Minties for your "significant other"! I look forward to dealing with you again in the near future. If wall plates could talk, this beast of a wall plate would be begging you to take him home and plug him in. 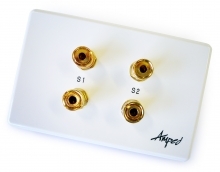 More than keen to get some speaker action going on, the Amped Classic 2 Speaker (White Wall Plate) comes dressed in 24k gold plated corrosion resistant contacts and features a custom Amped Classic white finish. Compatible with the latest in Dolby formats including Dolby DTS™, Dolby True HD™ and DTD HD Master Audio™ and crafted using the finest 24k gold plated banana plugs for the best possible signal transfer. Furthermore, the corrosion resistant gold with guaranty many, many years of perfect performance. Offering easy installation with no soldering required is a unique snap on design that both amateurs and professionals love. Compatible with speaker cable up to 10 AWG this wall plate is suitable for many applications within the home, office, workshop or wherever you require a tidy and professional, cable free look. My long VGA cable and guitar cord arrived extremely quickly and well packed. All working well, as expected. This is about the sixth cable I have purchased and am extremely happy with the service and products.